There is a new trend of moving larger kitchen spaces into the backyard, using things like granite countertops and outdoor ovens so you can better entertain your guests. If you never thought of adding an outdoor kitchen to your home, you could end up having a new favorite place to hang out if you go for it. With just a little creativity and a bit of help renovating a section of your backyard, you could end up with a cooking oasis to rival even the nicest of gourmet kitchens. Outdoor kitchens can be incredibly useful, especially if you are one who loves to entertain others. You can use it for all sorts of gatherings, from family events to charity parties. If you use granite countertops in your outdoor kitchen, you are using a natural material that is going to stand up well to the elements, look absolutely amazing, and be able to be used for far more than preparing food. Granite countertops give the feeling of luxury, even if they are placed in an informal environment. If you use granite countertops in an outdoor kitchen, you automatically make it feel more luxurious. You don’t have standard color problems, since granite can come in so many different colors and combinations. Plus, you can have them put all around your outdoor kitchen, wherever you think they would best fit. One thing that should be done with granite countertops that you use indoors is regular sealing. This can be done by a homeowner, but typically lasts longer when done by professionals in the Sanger, Texas area. When you get your granite countertops installed, you need to find out if they are going to need a regular sealing. This will depend on how the granite was cut for your counters. Sometimes you will have a naturally sealed surface which will repel stains like wine and mustard. However, other cuts will leave you with granite countertops that require a regular sealant be used if you plan on having anything on them which could leave a long-term stain. What better way to clean off your outdoor granite countertops than by just grabbing the hose and washing them that way? It saves you time, and keeps your granite countertops looking clean and new. Once your counters have dried from their cleaning ritual, if you won’t be using them in the next couple of days, or if you are expecting some type of heavy rain or hail, make sure you cover your granite countertops to keep them from any type of natural erosion. Should you miss a time where you got hail and now can see that your granite countertops are dinged up, don’t worry. Another amazing benefit of adding granite countertops to your outdoor kitchen is that they can be resurfaced if necessary, giving you a smooth, perfect countertop once more. One thing that you need to keep in mind is that your granite countertops are going to be exposed to some type of light when outside. This means that you are going to need to have your kitchen covered in some way. This is done to protect your granite countertops. Plus, it is done to protect you. Leaving your granite out in the Sanger, Texas sun is going to leave it screaming hot to the touch, making it unusable on sunny days. Sitting outside in the shade is always nicer than having to stand there in the hot sun, especially when you are working over a hot stove or oven with food. Don’t assume that you are going to have tree coverage, either, because eventually trees fall or need to be cut down, and they should be trimmed over an outdoor kitchen anyway to protect the food from having leaves and other debris fall into it. You should opt to have some type of a pergola or full roof extension from your house put over your kitchen to help keep it covered. 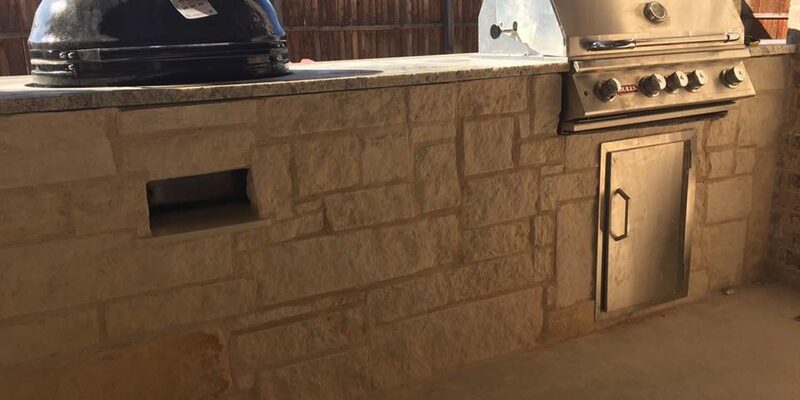 If you are considering adding an outdoor kitchen with granite countertops, you should call in people who have experience with this type of install. They can come over, look at your yard, and give you a breakdown of what would be possible considering your yard and the goals you have for your new setup. From there, you can get a quote telling you how much it should cost, and decide if you want that new addition to your backyard. For more information on both indoor and outdoor granite countertops, give Granite Huggers a call. They can come and give you a really good idea of what will work best for you, anywhere in or around the Sanger, Texas area, by simply calling (972)670-4533.